PHUKET: For globetrotting party-goers the line up of posh beach clubs has led them for years from Ibiza, to Miami’s Nikki Beach and down to the Caribbean for sundowners on St. Barts. Asia’s beach club evolution kicked off with the iconic Ku De Ta, and has now shifted into top gear with Cocoon, Potato Head and the Rock Bar at the luxurious Ayana Resort. A recent visit to the latter hallowed spot came complete with a night-club-like-queue that hit three digits. Here in Phuket, Twinpalms’ Catch was an innovator along with Baba at Sri Panwa, which continues to draw a “hi-so” crowd from Bangkok and abroad with star- studded events. One new project that has caught my eye is the pairing of the Angsana Resort (formerly Sheraton Grande Laguna) with Attica entertainment from Singapore. 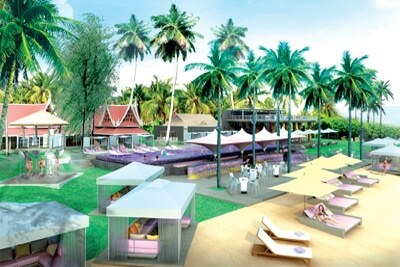 The two are teaming up on the Xana Beach Club in the center of popular Bang Tao beach. Construction is underway and an April opening is on the cards. Attica is best known for their popular outlet in trendy Clark Quay, which is under the same moniker and specializes in buzzy events. Looking at plans for the project, some of the cool hardware includes an Olympic sized swimming pool and thirty meter swim up bar. Double sun loungers are also a feature, but the “killer apps” are the cabanas, which hold up to 14 people and are equipped with service callers for when you simply can’t make it up from the day bed to order another round of drinks for your new best friends. A special party boat will ply the Laguna Phuket lagoons with onboard drinks. The ultimate destination for the boat will be a view of the west coast sunset and yes, there cocktails and food will follow. Eating options are highlighted with an Australian fusion menu, barbecue, seafood and for the healthy few a raw foods option. Mission possible for the group is creating the big vibe of Ibiza, with imported DJs from Europe and some type of secret nightly show. We have no idea what it is, so well have to wait just over three months to find out. On an island gone into convulsions with massive amounts of visitors quenching their lips with those tasty cocktail, beach club mania is set to dominate the next year or sos storyline. Another recent Bang Tao opening was Bliss Beach Club. Early reports are that the build-out and fit is done nicely and the food is getting a thumbs up too. Drinking, dining, lounging, yes and the inevitable setting of the sun are drawing interest. In the South, Re Ka Ta at the Boathouse rolled out just in time for the King’s Cup. Designed by Bali-based Fredo Taffin, who incidentally worked on Bali’s Ku De Ta, the Re Ka Ta, with new management and ownership of the hotel and outlets from the group behind Trisara, is gaining followers already. Turning the table up North, Malaiwana unveiled “Up” on December 17th with an imported chef and a concept that was kept hush-hush. Located on the glamorous Nai Thon Golden Mile, expect this to draw an upscale crowd. There remains a number of excellent and established beach spots from the casually hip Reggae Bay on Bang Tao and Siam Blue, to Kalim’s IndoChine and of course, sunset watching does not get any better than at Joe’s Downstairs. There will be more to come, and 2012 will likely be The Year Of The Beach Club. Writing this, my toes can almost feel the waves lapping with a warm gentle swell and where is my mojito, time to head to the beach it seems. Bill Barnett is Managing Director of C9 Hotelworks and can be contacted through W: c9hotelworks.com.